1 Synchro Monster + 1 Xyz Monster Must be Special Summoned (from your Extra Deck) by sending the above cards you control to the GY. (You do not use “Polymerization”.) Once per turn: You can Special Summon 1 Level 4 monster from your hand. If this card is sent to the GY: You can target 1 card on the field; destroy it. You can only Special Summon “Elder Entity N’tss(s)” once per turn. Elder Entity N’tss has been a hyped Fusion monster, almost as hyped as it’s predasessor: Elder Entity Norden. A Synchro and Xyz for N’tss to be Summoned, she can’t be summoned the same broken way Norden was with Instant Fusion. However, sending monsters to the grave isn’t a hard thing to do, and can help avoid grave-triggering effects off destruction if you have stolen your opponents monsters. N’tss gives you Norden’s same effect, however, it’s once per turn, from the hand, and no effects are negated. While the grave may be better to source a Level 4 or lower from at times, getting the monster’s effect is much better. Also, Norden was once, N’tss is once per turn. At 2500 ATK you may have N’tss for a few turns. She’s a LIGHT, making her fodder for removal, and she’s a Fairy-Type, giving her all kinds of support after she leaves the field. If she hits the grave you can destroy any card on the field. Only one N’tss is allowed per turn, but with the new rules that shouldn’t be a problem. The new rules make it hard for you to summer her at all. You need a Link Monster to open up slots for an Xyz and a Synchro monster to exist. Then, you have to commit resources to send to the grave to Summon N’tss. If you can’t do that, or if your grave is not an option, then N’tss is not an option. 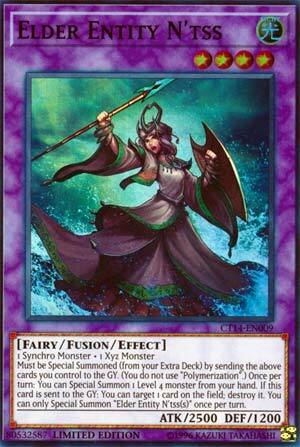 Without the Link Format rules, N’tss would be as hyped of a card as she was before. Now, she’s been nerfed because of the rules. The sister of Elder Entity Norden has arrived, say hello to Elder Entity Ntss. Elder Entity Ntss requires a Synchro monster and a XYZ monster and can only be Fusion Summoned from the Extra Deck by sending the Fusion Materials to the GY, no Polymerization needed. Idk how easy this will be to summon, especially in Link Era. Getting a Synchro and XYZ out at the same time can be hard unless you use something like PSY-Framelord Omega one turn and XYZ summon the other. Once per turn, you can Special Summon a Level 4 monster from the hand. Easy Rank 4 plays or Level 8 Synchro plays, but I don’t think two Extra Deck monsters is worth one. Also, if this card is sent to the GY, from anywhere, you can destroy a card on the field. Play your Mega Zaborgs and Infernoid Tierras ready, you got some popping to do. You can only Special Summon Elder Entity Ntss once per turn, but I doubt you will summon more than one anyways. I feel they made this card to overcompensate for Elder Entity Norden, who was very powerful. I feel they did too much and you are likely only seeing this played in Monarchs and Infernoids only due to the destruction effect, which is still pretty good. This card likely could/would be broken if not for the last line of text, that you can only Special Summon of these a turn. If you could bring out 3, you could have FIVE Monsters on the Field, in one turn, and what you could do with five Level 4 Monsters opens up lots of OTK/FTK possibilities, no? Note too how unique this summoning is here too, one generic Synchro Monster, and one generic XYZ Monster, which one might think would be enough to not have to warrant the stipulation at the end, but I digress. Light is still good, 2500 attack on a Level 4 is awesome, and you don’t need Poly to Summon this, so those are all pluses immediately. Once a turn, you can Special Summon a Level 4 Monster to your Hand. (In my opinion, from the Deck, then Hand, and finally Graveyard is the best order, but this also helps keep the card from being overpowered). Also, the card is a 1-for-1 when destroyed (assuming it goes to the Graveyard) because you then can target and destroy one card on the Field. I like this, a lot.